Start the day with Very berry porridge. Have a cheese omelette for lunch and an afternoon snack of Healthy hummus. For dinner, try this Vegetable chilli and for a dessert treat enjoy a portion of Apricot crunch. 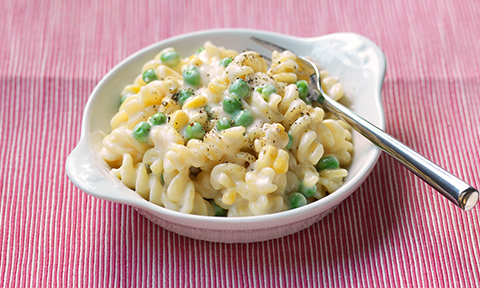 After a bowl of no-added-sugar muesli for breakfast, try a Vietnamese crunchy peanut salad for lunch and for dinner this Pasta and vegetable cheese. For dessert have a portion of Blackberry upside down pudding. Enjoy an Apple and muesli smoothie for breafast. Try Hearty minestrone soup for lunch followed by a Wholemeal fruit bar. For dinner, have a quick and easy Tofu noodle stir-fry with a tbsp of peanut butter and for dessert a portion of Apple, blackberry, oat and seed crumble. Start the day with 2 Weetabix and for lunch have a portion of this Mediterranean pasta salad followed by a snack of a Wholemeal fruit bar. For dinner, enjoy Pasta in brodo. Try an Apple and muesli smoothie for breakfast followed by Roast butternut squash and red lentil soup for lunch. Have a Wholemeal fruit bar when you fancy a snack. For dinner enjoy a Black eyed bean, feta and herb burger followed by a slice of this delicious Apple and cinnamon cake as a treat. Put some kick into breakfast with these Breakfast burritos. Try a Goat's cheese and roast vegetable pan bagnat for lunch. For a snack try Healthy hummus and for dinner Vegetarian shepherd's pie with sweet potato mash. With Fruity chocolate tray bake as a delicious dessert. Start the day with Very berry porridge followed by Pasta and vegetable cheese for lunch. At dinner time, have a Vegetable and chickpea tagine and a portion of Fruity chocolate tray bake.